After a brief but blitzy gastronomic tour through Johannesburg this past weekend I returned home in need of something healthy – something green. So I made this delicious + scrumptious + sumptuous salad. It’s fresh and easy – just add all the ingredients in a bowl, sprinkle with some salt and drizzle with lemon infused olive oil and a squeeze of fresh lemon juice. I like to serve the baby marrows still warm from the oven and then all the other ingredients at room temperature. It’s crunchy, creamy, tangy and really splashy in flavours. Enjoy. Baking the baby marrow: Preheat oven to 180 °C. Coat each baby marrow with olive oil and sprinkle with salt and bake for 30 minutes. Take out of oven and cut length ways. The broken-cheesy-olive-melba-toast: Break the Melba toasts up into pieces. 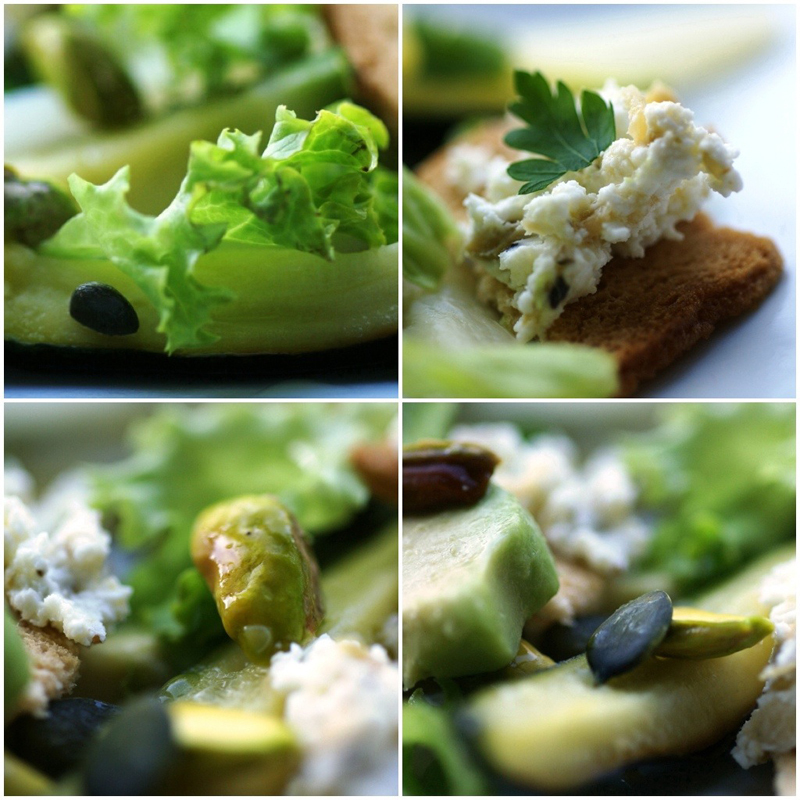 Mix the goats cheese, green olives and the lemon juice together and smear on each piece of toast. Making the salad: Mix all the ingredients together. Drizzle with olive oil and lemon juice. Sprinkle with some salt. My mond water vir daai croutons met bokmelk kaas! Yum!